As a lifelong member of the lucky bugger club, I'm off to Cannes next week to meet the cast of Baz Luhrmann's Great Gatsby. For "research", I've been listening to the star-studded soundtrack on repeat this week. A few tracks stand out: Jay-Z's 100$ Bill, which is packed full of dialogue from the film, makes explicit the link between Gatsby's self-made West Egg excess and 2013's hip-hop culture; while Bryan Ferry's lush, orchestral reworking of Love Is The Drug is an unexpected high point. On the other hand, Beyonce and Andre 3000 should be imprisoned for what they've done to Amy Winehouse's Back To Black. And everyone else seems to have been given the brief: "Make something like We Speak No Americano, only worse". 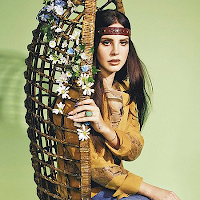 In the end, the only real keeper is Lana Del Rey's Young And Beautiful. Darker than treacle, and twice as sticky, it's enchanting and langurous, and a perfect fit for the story's tangle of stolen moments and doomed romance. You can tell Baz Luhrmann agrees by the way it's plastered all over the trailer. What's more, the song's motif is scattered through the film, with jazz and orchestral versions embellishing the score. Now there's a video, too. Directed by Chris Sweeney and shot by Sophie Muller, it's simple but effective. I'm not sure the film will be the same. PS: A clutch of great articles were posted on the Gatsby film today. Start with The Guardian, which looks at F Scott Fitzgerald's attitude to his most famous novel; then head over to the New York Times, which looks at how Baz Luhrmann has (or has not) picked up on those themes; and finish up with Rolling Stone, which brands the film "artificial and boring". Ouch.